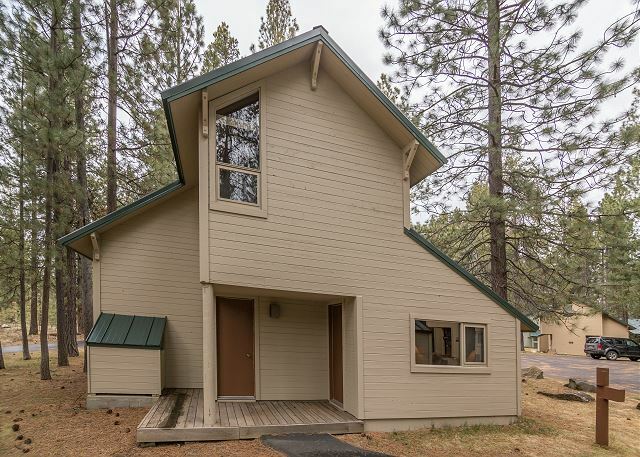 Ranch Cabin #31 is in the heart of Sunriver’s 30 miles of paved bike paths, minutes from the lodge and Village Mall. Take a free Ski Shuttle to Mt. Bachelor or warm up in front of the fireplace while connecting your laptop to the free wireless high speed internet access. 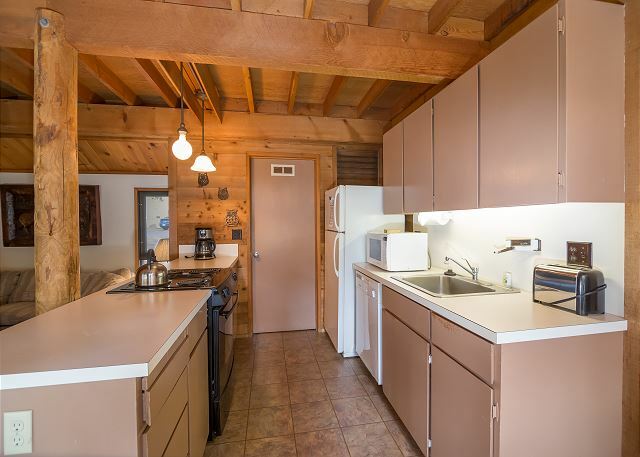 Ranch Cabin #31 is partnered with a first rate property management company that offers 24 hour emergency assistance, fully stocked kitchen, free Mt. 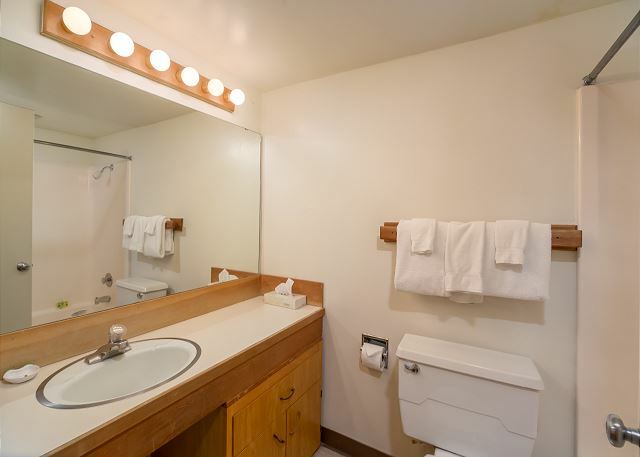 Bachelor Ski Shuttle, free high speed internet access, discounts to local dining & shopping and best of all…you can be confident that you will arrive in a professionally cleaned vacation home. Thank You for the 5 star Review, Terry! We hope to host you again soon! We loved the SHARC passes. The pool in the rach cabin condo area was also a hit with the kids. The furniture could use some updating, other than that, it was a great place to stay with lots of room for our family of 6. Thank You for your Review, Rob! Glad to hear that the Sharc and Pool was a hit and that the cabin was a great place for your family! We hope to host you again! Thank You for your review, Linda! Glad to hear that you enjoyed the peaceful setting and bike paths nearby! Come back Soon! love the ranch cabin condos. 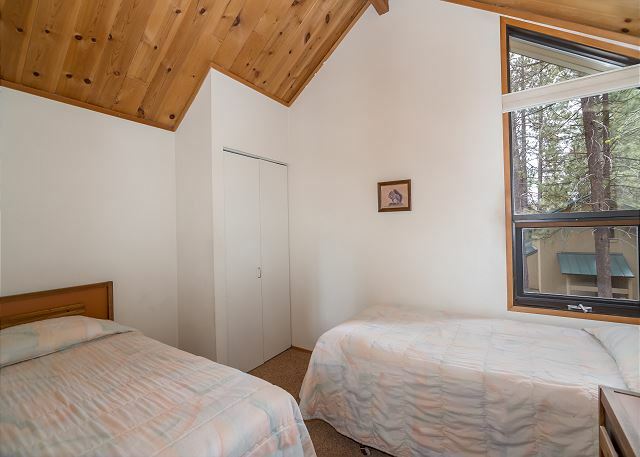 this cabin could use an update in living room furniture, drapes and electrical plugs. (beds are great) But, we manage with a bit of grumbling. Thank You for the 5 star Review, Kathy! We hope to see you again next year! Thank You for the 5 star Review, Dan! We hope to see you next year! Terry F from Portland, OR does not recommend this vacation rental. Thank You for your review, Terry! 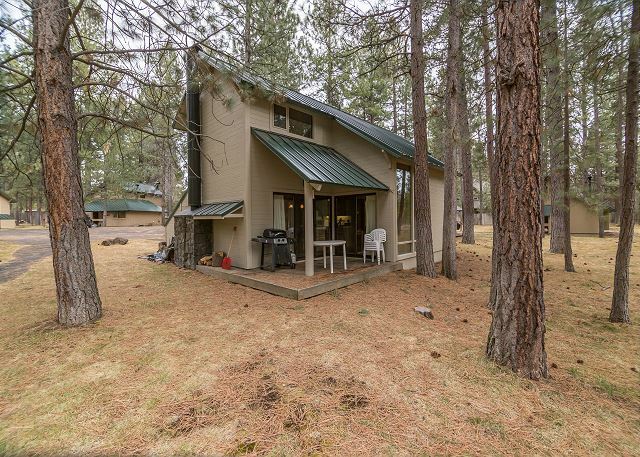 We are glad to see that you found Ranch Cabin 31 to be quiet and clean and hope to see you in Sunriver again! Thank You for the review, Justin! Glad to hear that you enjoyed your stay, we hope to see you again! As always, we enjoyed our say in RC 31. I especially like sitting on the deck watching all the bike riders, runners, walkers, etc. pass by as we are right on the bike path. Thanks for the great review Sue! We are thrilled that you enjoyed your stay. Sunriver is a great place to relax and people watch. We hope to see you again soon. The only issue we ran into was the lack of propane for the grill. The location was very good as it on the path for the longer runs and two of us were doing it. This allowed family to see us go by. The bike path was good for all of us, allowing the kids to ride a distance while still in site and the adults easy access to the rest of the bike paths. Great Family Time in Sunriver! We had a wonderful time swimming, bicycling and relaxing in Sunriver at Ranch Cabin Condo #31. 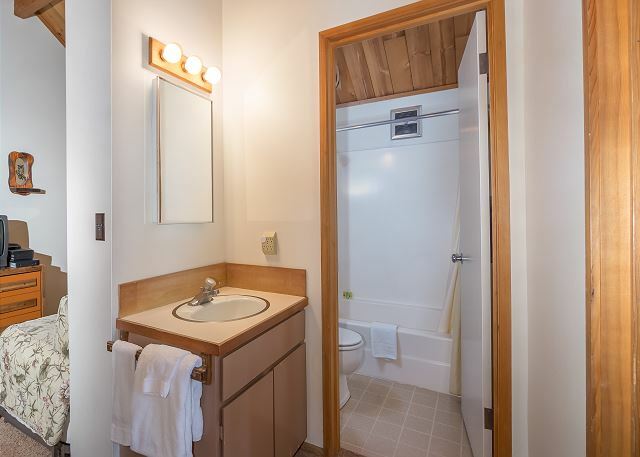 The Ranch Cabin Condos are perfect because of the community pool and easy access to the bike paths. The condo is nothing fancy, but is comfortable and cozy and someplace we look forward to visiting each summer. Of course no Sunriver vacation is complete without a visit to Goody's Ice Cream parlor and shopping in the village. We even celebrated National Doughnut Day at Hot Lava Baking Co.
Hi Shirley, it sounds like you had a wonderful time in Sunriver. 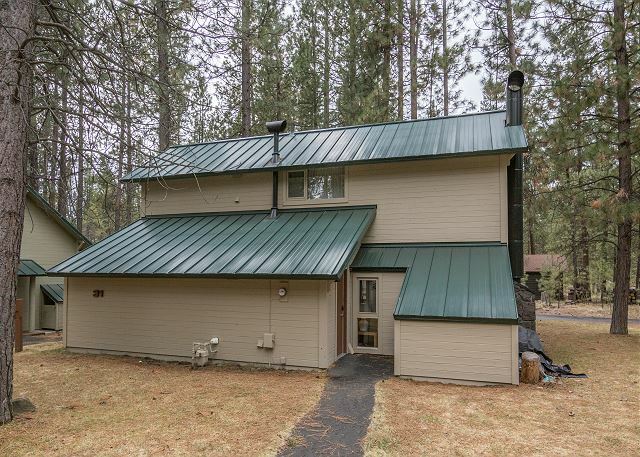 We are happy that you chose Ranch Cabin Condo #31, and we agree the location is fantastic. We hope you visit us again in Sunriver soon! Hi Terry! Thanks so much for the review and we are happy you had such a great time! 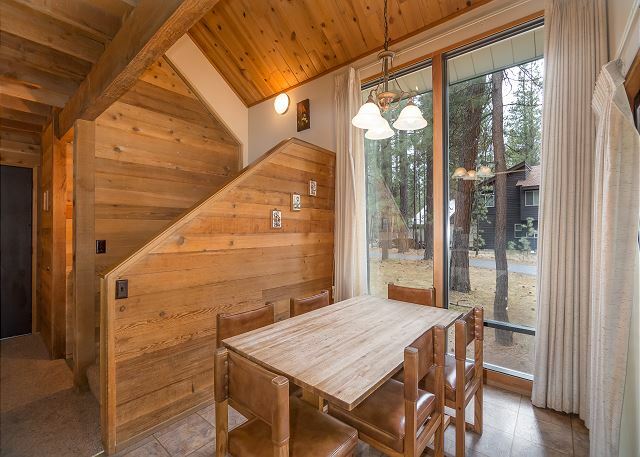 overall, this is a nice cozy cabin. It was clean with a well stocked kitchen. It could use a little updating (new TVs and maybe a new couch) but was a great place for my family. I would recommend to others! Thank you for this feedback, Eve! The owners of Ranch Cabin 31 have been working hard on updates, so this is GREAT feedback on what to suggest that we do next. 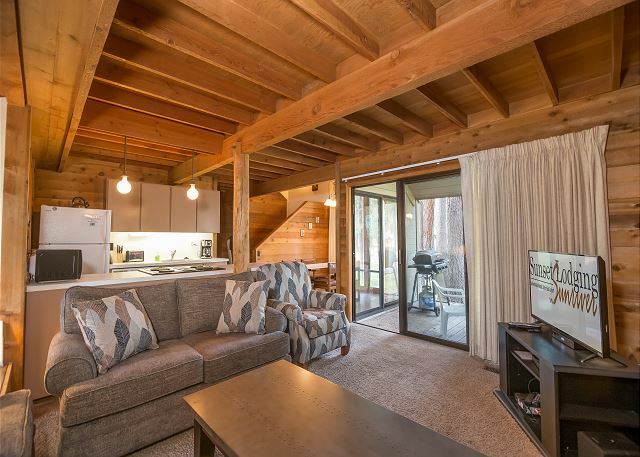 We hope you'll get back to the cabin soon and thanks kindly for giving us the privilege to host you on your Sunriver vacation! The personnel at Sunset were very helpful and pleasant to deal with. 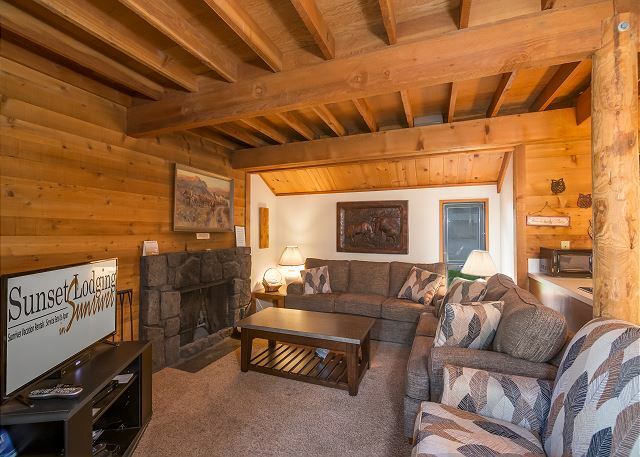 We have rented ranch cabins at Sunriver for more than 20 years. We found this house to be in general OK, but some obvious items need attention: the carpet needs cleaning, the drapes on one sliding door need repair to open and close properly and one sliding screen door needs repair so it will stay in its track to open and close properly. The deck is small but OK, however, the chairs are OK for sitting at the table, but not for a relaxing reading chair. A plastic Adirondack style chair would be great (there were many at other ranch cabins). In conclusion, this was a good vacation and my comments are not intended to only suggest items to be taken care of to make it a five star instead of a four star rental. Thanks for this great feeback, Ron and Linda. And thanks for choosing Ranch Cabin 31 and Sunset Lodging. We will have our maintenance team take a look at the slider and drapes. We hope you'll be able to get back to Sunriver soon, and thanks again for taking the time to help us get better. Kathy R from Portland, OR does not recommend this vacation rental. we love the Ranch cabins. This one (RCC31) however is in real need of upgrade--drapes, furniture, cupboards, dishwasher, oven, front of water heater flame cover etc. The front of the dishwasher (door panel) was off, the bottom of the oven would not stay in place, both front and back door knobs did not work, drapes did not close easily--way too heavy of fabric, need of hooks in the bathrooms, flame door on water heater fell off exposing the open flame. These problems could have been taken care of with minimal expense/manpower. It would have made our stay so much more pleasant. Kathy - we are very sorry to hear about these issues that you had at RCC31 and even more sorry that we did not have the chance to help during your stay. You have been our treasured guest for many years and perhaps we've been very lucky in the past, but ANYtime you have maintenance issues while you are here, we hope you will call us immediately and let us know. We've sent your feedback to our maintenance department and will address these issues. We thank you for the time you've taken to help us get better and we hope you'll continue to visit us in Surniver for many years to come. We had a wonderful vacation in RC31. We have stayed in Ranch Cabins for many years and have often rented RC31 (and 28 next door for more family). The living room furniture and TV are pretty old and dated but love the carpeted floors. It would be nice if the BBQ was cleaned before we came as well as the outdoor furniture (the inside was clean). The SHARQ passes were very appreciated! Thanks for your feedback Sue! Any time you have something that could be cleaner, please DO NOT hesitate to call us while you are here. We are happy to come out and clean or fix anything that will make your stay more enjoyable. So glad you enjoyed the SHARC, it really seems to add a LOT to our guests' experiences. Come back soon! This unit rented out on the lower end of the price range. Fairly spacious, although the furniture throughout is pretty run down. To the plus side, the rental company was easy to work with and friendly. Also, the unit came with SHARC, which we used as our visit was in July and was a nice fringe benefit. I am glad we were able to provide you good service, Joe! All of our guests deserve the best we've got. We'll take a look at the furniture with the owners in the off season. Thanks for this feedback, it truly does help us get better! We rented Ranch Cabins as the location is great and they have their own pool. They are a perfect location for riding into the center. Glad to hear that the Ranch Cabins work well for you, Glenyce! Hope you get the opportunity to visit again soon, we'll keep the place sunny and beautiful for you in the meantime! We're glad you had a good time, Sue! If a potato peeler is our biggest problem, we're in good shape! But we will add it to the property's shopping list based on your feedback (thank you!) We hope you'll be able to get back to Sunriver soon. We have been visiting Sunriver every summer for the past 6 summers. This is the first time we have stayed in the Ranch Cabin Condos. Although they are a little dated on the inside, they were the perfect place. We had 6 adults and a 5 month old and it worked out great. The deck is perfect for eating a meal together, watching people stroll by on the path and watching the great horned owl that nests above the house. It was so nice being so close to the bike path, the lake, the nature center, the observatory, the village......everything was really close by. We also really enjoyed having the private condo facility swimming pool. It was clean, never busy and a great place to relax. We really enjoyed our stay at Ranch Cabin Condo #31. Thanks for the great feedback, Allison! 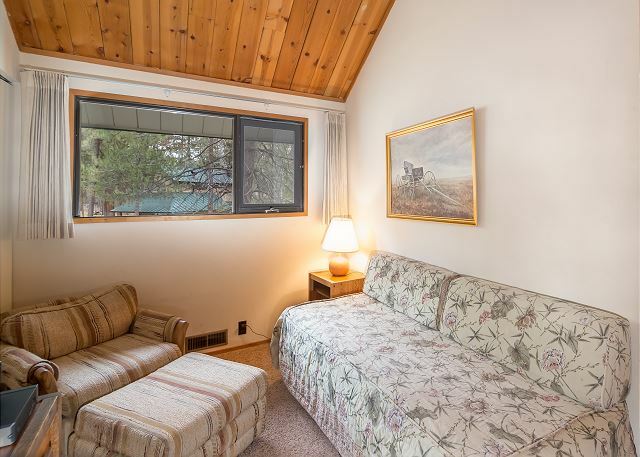 The Ranch Cabin Condos really do have a great location. 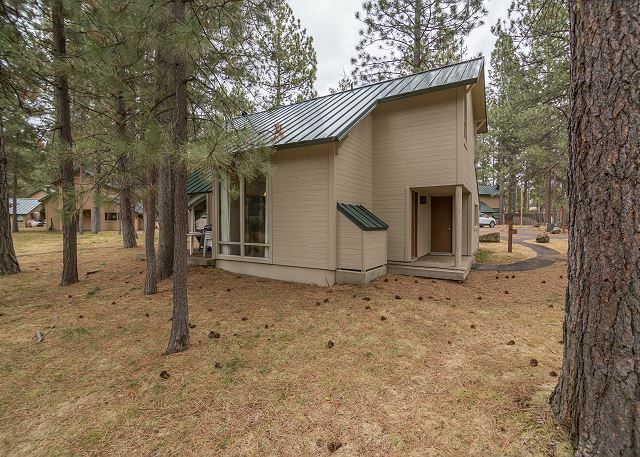 Please hurry back, your Sunriver home away from home awaits! The property and experience were great. The reservation process was very shaky. Made a reservation with Samantha with a cost of around $1050 for 5 nights. Brought to her attention the fact that we did not get the stay 4 and get the 5th free rate. She said she would check and re-send the correct price. A few days later after not hearing from her, I called back and was told that she no longer worked there and there would be no free night. In addition the new invoice from Kristi was for more than $50 dollars more. I explained the price difference and was told the would not honor Samantha's price. Not very happy, I looked for another property but could not find a property that met our needs at that date. I guess I kind of get the no free night, but to not honor a previous price was very unprofessional. I don't intend to use your service in the future. This is a large condo but it is really showing its age. 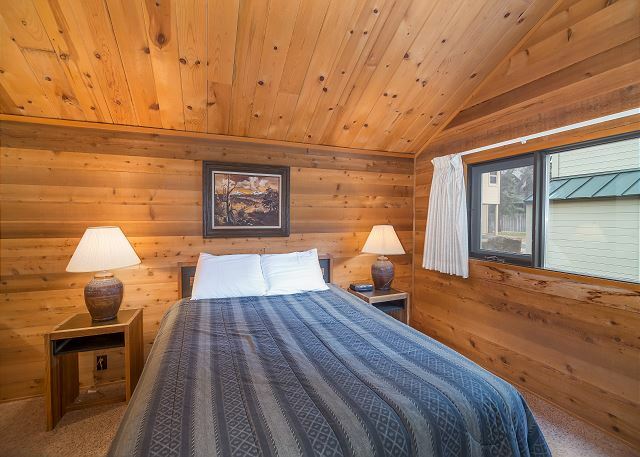 The three bedrooms plus trundle bed and two baths allowed our large family plenty of room. But the old sofas,old bed covers, and old bathrooms make this condo look tired and worn out. **Also the bottom rack of the dishwasher REALLY NEEDS TO BE REPLACED** That said, if you have children this is a great place to hop on the bike trail just outside your door or take a swim in the uncrowded condo complex pool. ** Also for some reason, the mosquitoes were HORRIBLE this year (July 2014). I have never seen so many mosquitoes at Sunriver. Even our dog would be covered in them when we took walks. So we were not able to use the back porch area of the condo because of them. We wanted to introduce our Michigan born daughter in law to the beauty of Central Oregon and Sunriver. After our recent stay in Ranch Cabin 31, she looking forward to her next trip. We all had a great time and enjoyed the rustic ambience of the Ranch Cabin's interior and the location close to the bike paths. Especially popular was the community pool available only to the Ranch Cabins. Definitely a nice place. I would stay again.